Colleran auctioneers’ next auction on July 23 will include properties in some of Galway’s most sought after and desirable locations with all amenities on their doorstep. The Claddagh is an area where Colleran auctioneers has enjoyed much success over the years, and there will no doubt be considerable interest in No 54 Fr Burke Road. This house is on one of the largest sites ever offered for sale in this very popular city centre location, just off the Promenade and less than a five minute stroll to the city centre. No 54 is an extended four/five bedroom end of terrace property with sitting room, study/ fifth bedroom, dining room, kitchen, and living room, and bathrooms on ground and first floor. The large site measures approximately 57ft x 154ft and there is a wide driveway to the side of the house leading to a very large back yard. In need of modernisation, this property will appeal to those looking to live in the city but looking for space and development potential not on offer with other properties, or maybe somebody with a requirement for large off street parking or a store area within the city. Advised minimum value is €300,000. Open viewing takes place Saturday from 11am to 11.45am. Also included in Colleran’s July auction, and also located just off the Promenade, is No 96 Ocean Wave, Salthill, a very desirable ground floor apartment opposite Grattan Beach in a beautifully maintained and landscaped exclusive development. Accommodation includes two bedrooms with master en suite, and an open plan kitchen/living/dining room with a feature solid fuel stove which complements the electric heating. One of the many attractions of this apartment is that it has its own south facing back garden, something seldom found with apartments, which makes No 96 extremely attractive for first time buyers or someone looking to downsize and retire as this property has a very homely feel to it. Due to its unrivalled location just off the Promenade and within walking distance of the city centre, and the unusual addition of a garden, viewing is strongly recommended. 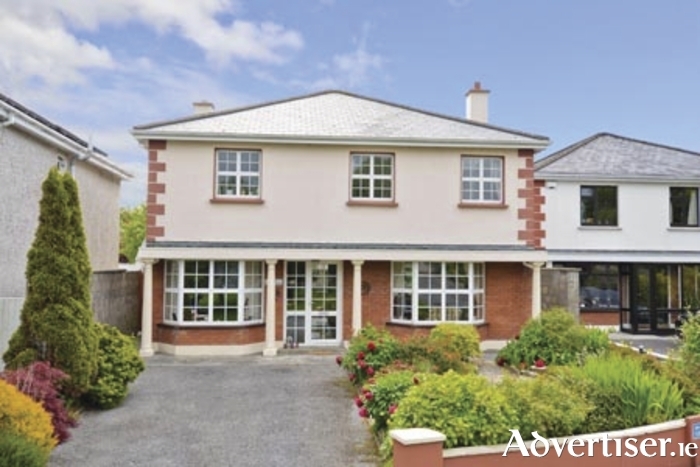 Advised minimum value is €185,000. Open viewing takes place every Saturday from 12 noon to 12.30pm, from now until the auction. If you are looking for a large family home then No 124 Dangan Heights, Newcastle, is a must see. Located opposite NUIG sports campus and close to the River Corrib and Menlo Castle, you have one of the finest recreational facilities and scenic river walks on your doorstep. This spacious five bedroom detached house will be very appealing to any family and viewing is highly recommended in order to appreciate its wonderful location and the spacious accommodation on offer. Accommodation includes five bedrooms, large sitting room, dining room, kitchen/dining room, study/TV room, conservatory, spacious utility, and ground floor toilet. Situated to the front of Dangan Heights, this attractive detached family home fronts on to a large open green area and has the added advantage of a very large southwest facing back garden with conservatory. The garden offers day-long sun and is not overlooked. There is an abundance of space on offer for a growing family, and with a number of schools and recreational facilities on your doorstep this is a family home certainly worth viewing. Advised minimum value is €380,000. Open viewing takes place Saturdays from 1pm to 2pm. These properties are included in Colleran auctioneers’ next auction on July 23. For further details call Colleran auctioneers on 091 562293.